Our total number of winners for the season ticked into double figures last week after another good Tuesday. La Rav won a seven furlong maiden at Salisbury under Jamie Spencer, building on his debut fifth at Newmarket last month, seemingly enjoying the better ground and doing things nicely by four and a half lengths. Pacharana got underway for the season at Lingfield later in the day and benefitted from a good, prominent ride from Luke Morris in a race that turned into a sprint. Her official rating has now gone back up to 80. We very nearly had a Tuesday treble, but Dubara was just unable to chase down the well ridden winner in her race at Salisbury. Stepping up to a mile and a quarter for the first time, Dubara missed the break and had some 15 lengths to find on the leader four furlongs from home and, understandably, got tired late on. Nevertheless this was an encouraging effort and she should be winning handicaps over this distance before long. Beyond Recall did not like the fast ground at Yarmouth on her handicap debut on Wednesday and so she did not let herself down on the surface and she is clearly worth another chance on ground with a bit more give in it. Spinnaka finished second for the fourth time at Newbury on Thursday, but it was her best effort yet as she probably hit the front a bit soon and was mown down late by a newcomer. She could either go back to seven furlongs or we will try and hold on to her a bit longer in another race over a mile. Either way, she should be off the mark soon. Pleasant Surprise ran in the listed EBF Lord Weinstock Memorial EBF Stallion Stakes (Ballymacoll Stud Stakes) on the same card. It was unfortunate that she ended up at the front of the pack given there was a strong headwind down the back straight which would have disadvantaged those at the head of affairs, but she ran with encouragement nonetheless and did not look out of place at listed level. Chocolate Box gave us another second on the Newbury card and should have finished closer but unfortunately he had the door slammed in his face when he was going for a gap. That was his best effort yet and hopefully he can win a handicap soon. So Sleek is another who is racking up the placings and did so again at Chepstow on Friday, finishing half a length second having been poorly placed. She has already run to a level good enough to win a maiden when things fall right. Our other runner on Friday was City Limits at Goodwood. He was upped in trip for his handicap debut as he needs a good test, but this race did not provide it. He should be seen to better effect in a more truly run race. Our third winner of the week came on Saturday evening at Lingfield, with Warsaw Road getting off the mark in the colours of Mrs Angie Silver. Warsaw Road had finished ahead of La Rav at Newmarket on his debut and, although he went backwards from that run at Doncaster last time, he was better than ever on Saturday, beating two more fancied horses. Unfortunately, Buxted Dream could not make it a double on the card and he finished second for the third time in a row. There is nothing wrong with his attitude, so it should only be a matter of time before he gets off the mark. It was hard to know what to make of Vuela’s run at Sandown earlier in the day. She had done well to win at Doncaster prior to that but was not able to build that run, perhaps due to the faster ground. We may try her at a flatter track back over a mile and a half next time. All three of our Sunday runners were placed, which was good. Blind Faith got back on track at Doncaster (third). She probably prefers a mile and a quarter, but can be keen, so we may keep her to a mile for now. Chief Craftsman bumped into one in the mile and a half maiden on the same card but probably still improved on what he had done prior. He will stick to maiden company next time. Finally, we had Mahabba make her debut at Salisbury on Sunday in the colours of Al Shaqab Racing. She wasn’t beaten far and was a little bit green, so we were very pleased with her third. Next week is a quiet one for us and we only send two runners to Royal Ascot. It would of course be nice to have more, but both El Vip and Banksea (pictured) both go into the Royal Hunt Cup on the back of good wins and are in top form at home, so we are as hopeful as you can be in a thirty runner handicap! 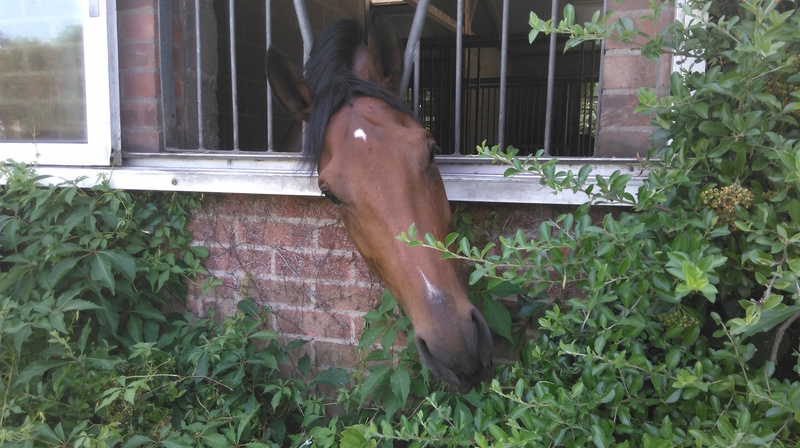 Our other runners next week will include Polly Glide, who will hopefully go for a maiden at Bath on Friday over ten furlongs provided the ground is not too fast. Her Newmarket form from April is working out well and she should be suited by ten furlongs. Near Kettering has not been done any favours by the handicapper, given 80 after his Redcar maiden win, but he will go for a handicap at Newmarket on Friday. Perfect Spy will hopefully make her debut on the same card in the ten furlong maiden. She has a nice staying pedigree but is quite a backward filly and will need the experience.